A digital 'sketchbook' of minimal sweethearts. I have always loved the idea of everyday, otherwise inanimate objects taking on a life of their very own. Here, my little lady does not seem at all surprised to discover that her pretty blue ribbons have decided to join in the dance. Wayward braids and a candy cascade. A rainbow of confectionary delights. Are they following her, or has she carelessly let them fall from her hands as she wanders off into adventures as yet unknown? New books. 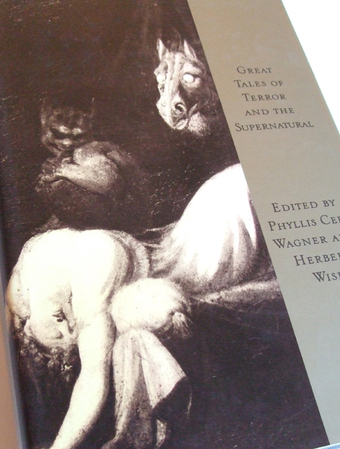 More for the ghostie collection (I am thrilled to see a Fuseli image on the front cover!). 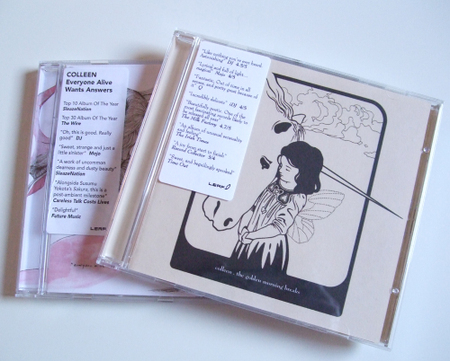 New albums by Colleen. Having never sampled her work before, I was in for a rather sweet surprise. Perfect mellow meanderings, akin to waking dreams. Childlike, ambient loveliness. Great new creations. My son bought me that same book..great tales of terror... I loved the cover too. Oh, Lou! They're darling. I like Ribbons and I LOVE Sweets. It's like she is leaving a candy trail so she can find her way home....maybe? How's the moving house coming? Did you find a place? I hope all of the details are working out just as they should just for you! I'm so glad I found your blog! I love the little girls who sport hair with a life of it's own! Kelly Link is in my top 5 authors list. If you like Stranger Things Have Happened, try Magic for Beginners... it's fantastic. She also edits a zine with cool artwork, lit and poetry called Lady Churchill's Rosebud Wristlet. I think it goes along well with your wonderful aesthetic. I must find that book myself!! Loove all the hair going on!! I live for braids and twist and turns!!!! Lovely art and great book. I love your newest works! I must tell you: the dresses your girls wear are always so charming; I want to add them to my wardrobe! hehe! Lovely new work! I'm curious - do you use doll images for those kinds of collages, or are they pure illustration? I can't wait to see what you do with your new dollie...I can't stop thinking about her. I've sniffing around a lot of bjd sites lately and am slowly collecting materials for/ working up the nerve to start one...My condolences on your move! Ech! We just moved, but that the smoke has cleared we are so much happier her than our old place...hope it will be the same in your case, making the dastardly move less painful. Also, have you read PD James? I've never read many mysteries, but I just read "Shroud for a Nightingale" - very satisfying! My experience of American McGee's Alice was similar -- overlapping and pointed in a different direction. The designer claimed that Wonderland had gone horribly wrong as she grew up, but What struck me was this: What if it had been like that all along? I've always been shocked at a child's tendency to simply accept injustice and even outright horror as a simple fact of life. I think as adults we've all had the experience of telling someone about some aspect of your childhood, and only realizing the full awfulness of it as you revisit it through adult eyes. Your art is stunningly beautiful and thought provoking. Have been 'lurking' for a while. Have been speechless, until now! You are just so talented and creative! Keep going because I don't seem to get my fill of your lovely creations! thanks for all of your comments!